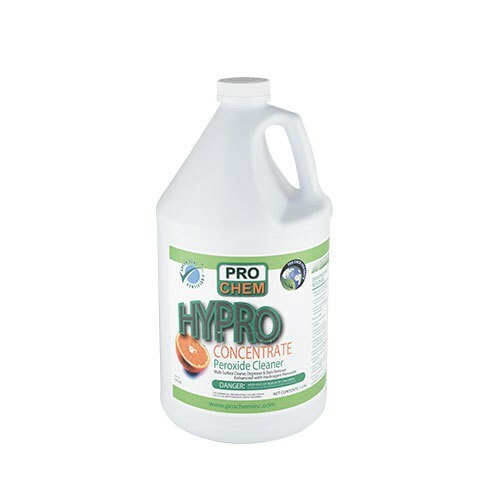 HYPRO | Pro Chem, Inc.
HYPRO is an environmentally responsible, all-purpose cleaner/degreaser. By combining the versatile power of hydrogen peroxide with the cleaning power of d’limonene, HYPRO is a safe, effective cleaner. The effervescent action of hydrogen peroxide actually lifts soils away while reacting with many sulfur and ammonia-based compounds to eliminate odors, leaving a pure clean without scrubbing. 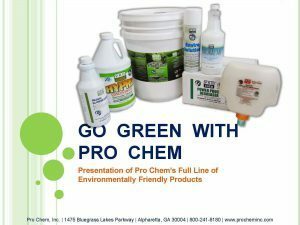 This product helps eliminate the need for specialized cleaning products by providing one cleaner that is safe to use on any surface not harmed by water. Its broad usage helps reduces employee training and minimize accidental product mix-ups by handling all of your day-to-day cleaning needs. Light Duty: Use 1 part HYPRO to 40 parts cold water for general cleaning. Heavy Duty: Mix 1 part HYPRO to 30 parts cold water. General Cleaning: Use as a spray and wipe with a sponge or hand pad. Floor Surface: Mop on or use an auto scrubber.